70% density will block out 70% of light. Constructed of high density polyethylene, the tough lock-stitch design of this knitted material resists rips, tears and fraying while reducing wind speed and heat build up in structure. Fabricated pieces include black reinforcing tape on all four sides. 70% density will block out 70% of light. Constructed of high density polyethylene, the tough lock-stitch design of this knitted material resists rips, tears and fraying while reducing wind speed and heat build up in structure. Fabricated pieces include black reinforcing tape on all four sides. Reinforcing tape is a seat belt like material that provides extra durability along the edge of the piece and allows installation of grommets. Fabricated sizes include a brass grommet in each corner of the piece and approximately every 2' apart around the entire perimeter. Grommets allow easy installation using rope or zip ties. We guarantee our stock shade pieces will be within +/- 4" of the published dimensions. Accuracy has only very rarely been a problem, but keep in mind these variances. We are in the South and purchased Shade Cloth for our pergola. It has lasted through the hot direct sunlight and few hurricanes. The product has been amazing for 9 years. We are now going to replace the cover with the same and are very happy with this product! I installed the 10' x 12' 70% shade cloth under the lattice top of my pergola. The shade cloth works great to eliminate the bright warm sun and still allows air movement and light. The product arrived within a few days of ordering and is very well constructed. Your description of the product is very accurate. Great company and great product. Thank you. This shade is very high quality, after purchasing we decided to put a hard cover on our pergola as we wished to keep the furniture dry underneath, so we returned it. The return process was seamless. Order with confidence from this company as they will do the right thing if their product doesn't work for your purposes. We added our own SHADE to our new patio pergola structure. 70% shade is perfect; the brown is beige tones; exactly what we wanted. Stretching was so easy, even for 2 seniors. Love it! We've ordered several of these and they are very well-made and effective. This is our 2nd year for several of our shade canopies, (stored during winter) and we have had no problems with them at all. I love my new shade cloth. I can't believe how much shade I now have. Was very easy to choose the right size to fit over my pergola. Product was well crafted exact specifications. Held up through Harvey shade the chicken pen. Good prouduct! Bought a 12x20 tan sunshade which I suspended over my back yard. The shade has been hanging for over a month now and holding beautifully with little or no sag. Quality construction and well worth the money. Thanks! It is strong and well-made. We have used it above the roof of our sunporch, which has a glass ceiling. We've noticed a great decrease in daily temps for this 1st month of usage. We love...love...love our Shade Cloth! I am ordering another right now for our pergola. It is 20x24 so we will also need to order 2 more in the future. It makes all the difference in the world in shading our patio. It's perfect along with being reasonable in price. Thank you!!! Faster delivery than expected. I won't be using it until next Spring so I can't comment. Perfect shade for our patio. Fits great and easy to install. Highly recommend it! Quick delivery as well! PUT IT OVER MY NEW DECK AND IT'S FANTASTIC. CAN SIT OUT THERE AND NOT GET BURNED. PLANTS LOVE THE FILTERED SUN. TAKE DOWN IN WINTER (DON'T HAVE TO) AND BACK UP WHEN THE HOT WEATHER STARTS. It is a nice sturdy shade cloth, it does the job as expected BUT be aware of the fine print shade pieces will be within +/- 4 of the published dimensions because mine was about 3 smaller on the long side. This is a problem if you want to fit a specific place. My first purchase was about three years ago. I bought a 20x20' white 50% shade cloth. I used it to create shade over my driveway. Between me leaving it out during winter and the high winds we have here, I am AMAZED at the durability of the product. I just bought 2ea. 8x8 70% shade cloths to cover, under my pergola. The quality of the cloth is outstanding and the seams and grommets seem to be indestructible. I'll come back again for any other projects I have. We debated forever about what % screen to use and this turned out to be the perfect blend of keeping the heat off, and letting the air flow up. On very hot days it is cooler under the sun shade than under our roofed porch. At 90 degrees in direct desert sun. (Yes there is desert in Idaho). It works great. I do think that once you get toward 100 degrees a double layer with space in between would be best. We tested that and may buy another one for that purpose. Product appears very well made and is exactly as ordered. Also arrived in a timely manner. I use it to block out the sun on my front porch. Now I can sit there in the evening and not get blinded by the setting sun. Very happy with my purchase. Seems like a quality product and arrived on time. This is an excellent product manufactured beyond my expectations, the minimal cost should extend the the lifetime of my boat by reducing the uv rays and is keeping leaves from collecting in it where I no longer have the chore of cleaning before I use it.I am so glad I found your product. The shade cover I ordered arrived as scheduled and made to my custom order. Grommets were placed as per specs and the installation was very easy. The shade cloth cover does exactly what I needed to keep the sun off my RV. arizona heat is pleasing with a shade that is made with the best shade in the U S A. 12x20 is a lot of the best shade you can find on the market. It's all way a 5 and better. The shade cloth that I needed was to cover a pergola over my deck. It is perfect for what I needed and fit just as advertised. Good quality as well. The edges were sown and the grommets were spaced evenly. Thank you for making my purchase a good purchase. We purchased this shade cloth to go on top of our pergola. The wheat color is a great shade. It very well made and seems to hold up in the weather well. Super fast shipping. Quality of product was excellent. Dropped and kept my pool water by 10 degrees. Sturdy and light weight. Allows rain and wind to pass through but keeps the heat out. This shade cloth is well made and high quality. The size is a bit bigger than expected, usually they are 3-5% smaller than the stated size after the edging is done. This is close to 100% the stated size. I ordered the shade cloths to use with my pop-up tent for craft shows. I wanted material to bring some color to the boring white tent as well as be sturdy and durable. The shade cloths were easy to set up and I received compliments on how they looked. This shade cloth has served us very well over our large pergola/deck. Since I expected it to last only about 5 years I am quite pleased that I got a couple extra years out of it. (Always stored it over winter with fabric softener sheets to keep critters out of it.) mine was a custom order & great care was taken so the seam fit perfectly on the beam so it's completely hidden. We can enjoy being outside all day--and we do!! Great material, pleasant lighting, doesn't act like a sail during windy days. Very well put together product. Highly recommended. We ordered three 6x12 panels for our outside arbor - measured the spaces between major beams and accounted for the +/- 4inches. We had no issues installing them. My husband measured where each of the grommets were, put in hooks and used bungee balls. Worked like a charm. This provides much needed shade for our outside space and I am thrilled with it! I wish we had known about this website sooner. The shipping cost and time to get to Hawaii was amazing. Although it said a few weeks, it was delivered in one! This is great. Already finished and less cost than many shade cloths that are raw around the edges. So why a 4? Because if you take the trouble to do something so nicely and you offer various colors of the cloth, then WHY oh WHY would you do a finish hem in BLACK for a light beige shade? It is glaringly ugly. So I bought tan grosgrain ribbon and sewed it over the black edging with just a small reveal of the black showing on the very outside. Chic! I got this as a replacement to one I ordered from you guys years ago. I use it during the summer to cool down the back of my house and patio, which are covered by a polycarbonate roof. UV has taken it's toll on the binding of the old panel, but I'm happy with it's performance and never expected it to last this long. The shade cloth itself is still serviceable and will be repurposed. This product does a decent job of shading, if I could keep it up- but within the first two hours of installing, one grommet broke/came out, and within two days several more were out...no response from the company when I emailed-- will try calling next. I love this shade cloth. Using it to cover a 12ft x 18 ft deck shade structure. Noticed a 20* temp. difference. High quality gromets and edging. Looks great. I bought a 6x8 shade cloth for my small second floor balcony that gets direct sun all afternoon.The shade cloth blocks the sun from radiating through the sliding glass doors and reduces the temperature considerably. And it is easy to take down if a storm is coming. Since I was putting this shade cloth over a beamed ramada on an upper deck, it was important that the edges of the shade cloth line up with beams on all four sides so that the grommets could be used effectively. I had measured carefully before ordering and found this cloth to be just right. Wrong! It is uneven and sort of wavy (up to an inch difference) which had dire consequences for me and the handyman who was installing the cloth.It's good for shade and light. Time will tell about durability as the AZ sun and monsoons take their toll on most things. Everything I wanted and more than I expected. The sun screen replaced a dead vine growing on the pergola. The screen provides much better coverage and none of the mess. It has weathered several nasty storms already this years and has proven its toughness in wind. My plants love it even more than I do and I've cut water use. This product is well worth every penny. Being in Arizona it is really hard to do lush in a yard. Your product is amazing....I'm on number six in my yard...I call it patchwork sun shades. I have tons of roses and tropicals and I'm on year 3 with my first two big one. Coming up on fourth monsoon and we will be dealing with 65+ mph winds this year....haven't sustained any damage. I have friends now doing the same thing in their yards....don't look any further..great product..great customer service very fast delivery! I used this as a pool equipment cover. It works OK, but I haven't been able to get the fabric very tight. I pull the nylon Edges tight but the fabric rattles in the wind. Any ideas? This is the second screen i purchased from Greenhouse and am very happy w/ the quality of both screens. Both times my order arrived in a timely manner and the product does the job. Fast shipment, good customer service. The overall experience was good. The grommets do not hold very well when applying tension to the shades. I live in the Arizona sun! I bought one of the aluminet coths in 2004, and it just bit the dust last month (8/2013), mostly because the taping tore away from the shade cloth. It held up under extreme sun and monsoon conditions. I just replaced the aluminet with the Decorative brown, and it looks more sturdy and supplies SIGNIFICANTLY MORE SHADE. Very satisfied with the products and the service. Economical way to get exactly what I need.Came very quickly and works great in the hot AZ sun to shade the patio. I'm going to order more to shade my garden. Having custom sizes reduces waste. The shade cloth was exactly what we needed to cover a new pergola. It allows the perfect amount of sun to filter through. Nice quality and reasonable price. I had to have an old shade tree removed in front of my house, so my hostas were burning up. After a web search, I found your shade cloth, and thought it would work for me. It arrived quickly, was well made, and doesn't look too bad for an emergency fix for my garden. Thanks so much-----the hostas are all in full bloom because of the shade your cloth is giving the garden. Our shade cloth is very nice and well made but it is 6 inches too small. This is really very annoying but we can still use it. I love this Shade Cloth. I plan on ordering another one in the near future. I installed this material of my deck to provide an ample amount of shade. Have used this type of material on the deck of my previous house. Very durable and stronger than I remember. Allows the perfect mount of sun light. The binding allowed me the flexability to cover the 12X16 pergola with a rope design on the sides. Was extremely pleased that the grommets hold well allowing you to strech the fabric with no wrinkles. Love my shade cloth.We put it on top of our newpergola, and the sunlight filtering though it is lovely.Plus, it arrived promptly, edgesbound perfectly, grommetsall in place. And the price was as good as I found anywhere else.Totally recommend. We were so pleased with the quality and speed of our order. Installed a 12X24 over a pergola with the west side to ground level. Fastened with eyehooks to the gromits directly to the frame. Getting ready to order another for the chickens. They'll love it. Great Product. Just built a pergola, but this was the icing on the cake to really have some comfort and shade. I HIGHLY recommend this. Install with bungee cords made for securing tarps. You can get them at Lowes. I've recommended this to several friends already. Time will tell on durability, but even if I have to replace every couple of years, it's worth it. It was perfect it cut down the heat a great deal, that is what we wanted. Very good quality. Exact size I ordered. I'm using on top of pergula. Works very well. Now I can use pergula in the afternoon, which I couldn't before because sun was so hot. Love it. Quick delivery, actually received it before I expected. The shade cloth was received promptly and was installed. It has proven to be a wonderful addition to my deck. At last, we can now enjoy our deck even when the sun is beating down. It's actually wonderful to lounge around our deck now. Very impressed with speedy delivery and quality of product. We installed the 10 by 18 shade cloth and have been enjoying our deck without the scorching heat of the sun. Shade screen is as described. Quick delivery. Price was competitive. Quality very good.My peppers are happy even in the triple digits. Great product, excellent service, and speedy delivery! We installed this product in 2007 on our patio cover which is 1 1/2 X 1-1/2 RR alternated open space with polycarbonate rain proofing. -- Still too much Sacramento sun and heat. We added this product and it made my patio very pleasant. With misters surround for summer and area space-heaters for winter we have a year-around patio. It has been 4 years and it is just now showing signs of fatigue. Not bad at all considering the 106 degree temps in summer and down to 17 in the winter. I am going to buy this product again when it becomes necessary. A great product!! Lasted now over 4 years!!! The summer temperatures in Redding are commonly in the 100's and the intense sun is very damaging to my spa lid. By draping shade cloth over the spa I reduced the harmful effect of the sun but it wasn't long before the shade cloth tore. All along the perimeter of the spa and down the middle (where the lid folds) I realized that the chlorine fumes must have degraded the cloth and that's where it first began to tear. 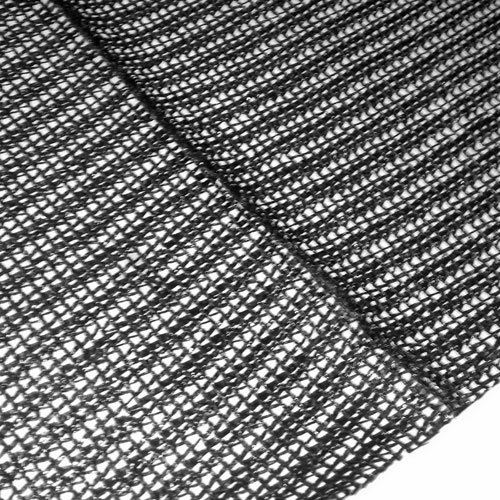 In other applications the shade cloth would last about 3 years before it began to tear at stress points. If there is a more durable shade cloth (that can withstand the intense sun)please let me know. If you can recommend a tarp or shade cloth that is resistant to chemicals used in the spa I'd like to know about it too. Thanks for following up and for the concern about my experience.